Sonic Youth was a rarity in their heyday, a band in pursuit of pure artistic expression signed to a major label trying to selling hundreds of thousands of their albums. I just finished reading a book about them, "Goodbye 20th Century" by David Browne, and it got me thinking about many of the issues we talk about in wine. I thought about the disconnect between popular culture and critical acclaim. About the limited commercial appeal of uncertainty, and of artistic expressions that are anything but smooth and easy to understand. And how it's possible to compromise one's art either too much, or too little. Sonic Youth never sold anywhere near as many discs as, say, Hootie and the Blowfish, but you couldn't find a critic anywhere who would publicly prefer Hootie. Publicly. That's a key word. 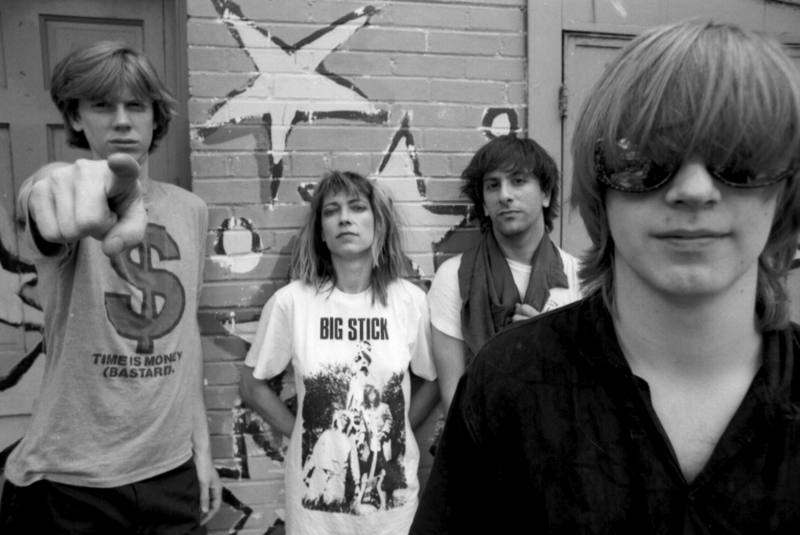 Sonic Youth in the '90s acted as an arbiter of coolness, and a music writer wouldn't be taken seriously by the congnoscenti if he didn't praise them. Yet when they moved to the suburbs, nobody in town knew who they were, even when told they were musicians. I think about how many wine columns are devoted to Jura or Irouléguy other obscure critical favorites, and how few about California Chardonnay. Also, how dismissive most of us writers are about the supermarket wines most people drink: the Hootie and the Blowfish wines. Vintage is important in Sonic Youth, because they were restless and improvisational. And yet, their sound had a definite terroir. They tuned their guitars in unusual ways, and left in unplanned feedback. Their sound developed, expanded and contracted over years, but was always recognizable. For a core group of fans, that vintage variability was a plus. But most ordinary people, non-critics, preferred a band like Boston that always sounded the same. Sonic Youth's 1988 album "Daydream Nation" is in the Library of Congress' National Recording Registry. It's generally considered their peak, and is the album you should start with if you don't know their music at all. It was made independently with no input at all from a record company. After that, they signed with Geffen and spent months and hundreds of thousands of dollars in 1990 to make "Goo," an experience they considered miserable. I know you're expecting me to write that "Goo" sucked. In fact, it is perhaps my favorite Sonic Youth album, and I don't think the band itself has perspective on it. There are still feedback squeals and descent into noise, but it's more focused than almost any of their other albums while still being creative and unpredictable. Are commercial compromises always the worst thing for an artist? It's a complicated question. "Daydream Nation" is truly great, but most of their other albums are not on the same level of excellence as "Goo." When Geffen gave up on the band ever selling a lot of records and let them make whatever albums they wanted, they produced drudge like "A Thousand Leaves" and "NYC Ghosts and Flowers." Few bands stay exciting after their first decade. Sonic Youth was no exception, and until reading the book I wouldn't have made the connection between their decline and the whole art-commerce thing. But in fact, I thought a lot about natural wines when I read about how Sonic Youth made albums in their decline phase. Guitarist Thurston Moore preferred to use the first take because he thought it sounded most natural (to the frustration of drummer Steve Shelley, who preferred to polish his parts but was usually overruled.) The band would sometimes jam together without practicing first, record it and release it on a sub-label as part of their SYR series. They'd leave in all sorts of imperfections. Their music in this period was, simply put, more interesting than good. I've had wines like that. Are they really better? What do we sound like when we, the arbiters of coolness, champion them? Moreover, if one were a critic who championed Hootie & the Blowfish wines, which people actually like, wouldn't one rightly expect to be both popular, and regularly mocked by the kool kids? I don't want to drink Hootie & the Blowfish wines. But I don't want "A Thousand Leaves" wines either. Maybe "Daydream Nation" wines are the ultimate expression: a vintage when the terroir is perfectly expressed, when letting things happen as they will results in a classic with edge and power and softness and beauty. But not every vintage works out that way, and maybe we arbiters of coolness shouldn't be so quick to dismiss ... oh man, this works on so many levels ... wines like "Goo." I like the analogy and for the most part I think it works. Another facet, or way to look at it, is that the making of music and the making of wine both share two common attributes: each are artistic endeavors and each are commercial endeavors. The purpose of the first attribute is to please the artist, the purpose of the second is to please the consumer. In music and in wine, I like those who practice their craft so as to maximize both attributes, keeping them in relative balance.